These noodles take 15 minutes to prep and cook, although you'd never know it by the taste! A perfect, after-work meal. Fill a large pot about three-fourths full with water. Cover, and set pot on stove over high heat to boil. Meanwhile, add all of the sauce ingredients to a bowl and mix using a hand mixer or a wooden spoon until sauce is smooth. Chop green onions, if using, and set aside for serving. When water begins to boil, add approximately 1 tbsp of salt to the pot and place pasta in the water. Stir the pasta frequently as it cooks so the noodles don’t stick together. Test pasta after approximately 7-8 minutes, but cook to your preferred doneness. If using a different pasta shape, be sure to adjust cooking time accordingly. When pasta is done cooking, drain and return noodles to the pot. Immediately add sauce to the pot with the noodles and stir to combine evenly. When serving, plate out servings and add chopped green onions and sesame seeds (though both optional). 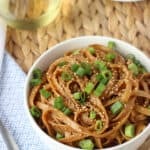 We really enjoy this recipe with brown rice noodles, too!